What is there to say about Emma which has not already been said? I hardly think that I can add anything to the world's discussion, except to document some of my experiences in re-reading this classic. For starters, I have to tell you that I found this Jane Austen collection at our local used bookstore which I snatched up instantly. I already owned the works of Jane Austen but my previous copies were not 6x4"! I've scoured Google and Amazon and can't find the collection listed anywhere (even the website on the back of my book is no longer valid) but I did find the ISBN number for it on Amazon and I've linked to that. (It's remarkably cheap and incredibly cute.) I think it fitting to read Austen from tiny Austen-sized books! The cover art that you see here, is not of Emma but it is the only picture from the series of books that I could find online. As the Amazon reviewer mentions, the font in the book is small but, still, it adds to the experience. I quite liked reading this smaller edition. It also received compliments wherever I took it. MA: What are you reading? MA: Oh. Huh. Any good? Me: (With an inward sigh of despair.) Yes. MA: Have you ever read _________ (insert someone whose name I've forgotten but who writes modern thrillers)? When a reader walks into the ER with a classic work of literature, you can actually add more pain to their experience by declaring that you'd never heard of it before. (Sigh.) At any rate, I made it through the ER experience just fine (I'm all good now! Really!) and also made it halfway through Emma before I finally got to go home. I also recently got together with my in-town friend to watch the 2009 BBC Version of Emma and we both loved it thoroughly. The only big variation it takes is in the opening scenes. In the BBC version it starts with Emma, Frank and Jane Fairfax as children. Otherwise, it follows the book closely and as it is a four part mini series, it also covers the story very well. I believe actress Romola Garai did justice to the role of Emma and it was a thorough delight. I heartily recommend it! Watching the movie is definitely an experience which is made far richer by reading the book again. I felt I could appreciate it more fully and with greater understanding. Either which way (book or movie) I enjoyed my re-reading experience. And now I shall stop rambling. I read Persuasion for the first time this year (listened to it on audio, actually) and I love that book as well. I hope I don't break your heart when I tell you I have never read Emma. BUT, it is in my stack to accomplish. I wish it were part of a reading challenge so that I would make it a priority. I can't wait to get to it. I'm glad to know all is well after the ER visit! I *have* to have a book with me at such times. I'd go stark raving mad staring at the bare walls. I'm glad Emma kept you in good company. 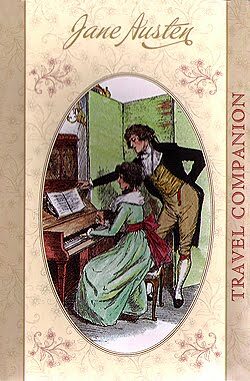 I had read it in a college literary criticism class and loved it -- that was my first Austen book. I just reread it not too very long ago. I like the Gwynneth Paltrow version of Emma but I like this newer version, too. Mr. Knightly is my favorite Austen male protagonist. I have had that *exact same conversation* about any number of classic books. To paraphrase another favorite author, "What DO they teach in schools these days?" If it makes you feel any better, I have read and loved Emma. In some ways, I think that she is Austen's most dynamic (i.e. growing) protagonist. Her whole worldview turns on its head and she is transformed as a result. I am of course, jealous of your dear little Austen book set, but I am pleased that it has found a good home! I am also glad that you had excellent company, if in a book, during your ER visitation! I would much rather read Emma for the umpteenth time than *insert popular degrading novel here*. I had heard of the BBC miniseries and I am looking forward to making a further acquaintance! I watched that adaption with someone we both know whose name I will not drop, but rhymes with Feric Spearcy. (I know...I'm SO subtle) And when Emma at first tries to stop Mr. Knightly from "changing the friendship" he definitely yelled, "NOOOOOOOO!!!" Which was funny coming from the SOLE male in the room. This is my favorite Austin and SO many people I know are reading it right now. My youngest sister just finished it. My pen pal is reading it, and now you. Maybe the muse of literature is trying to tell me something. Your pint sized editions sound hilarious. And I've actually had a similar conversation to the one you had with your Male attendant. It caused similar sensations of groaning in me too. Do you have a favorite Austen, Carrie? I confess--I've never read it! But I have seen the movie (Gwyneth version) a few times. As for you--all's well that ends well?! I *THINK* I read it back oh, about eight years ago or so for a graduate English class (or did I?) Can you tell I can't remember it? Glad to know you're well! I was delighted to discover two of the Austen miniatures, "Mansfield Park" and "Persuasion", last fall at my local T J Maxx, of all places, for only $2.99 apiece! Hoping to complete my newfound collection, I searched the entire store over, but sadly, to no avail. I've never seen these offered for sale anywhere since. I agree: that adaptation was fantastic! I recently found some really old Jane Austen books, but they had such small print, I debated whether or not to get them. I did, for the artwork in the front more than anything. They ended up being free, so I am glad either way I got them. I'm glad you're okay! I hate you had to spend so much time at the ER, but at least you got in some good reading time. I spent my (only) ER wait time quilting. I realized I was drawing the attention of an elderly man. He and his daughter cheered when I got my needle threaded and he offered "My mother used to sew." He was curious to know what I was making and where I learned to sew. When he left he said, "It is so nice to see someone doing something other than staring at one of those little computer thingies." I daresay the same applies to your reading a *real* book. My favorite public reading interruption is when someone asks "What is your book about?" when I'm reading a classic. You are very funny. That's all. Loved, loved, loved this post. Emma is totally on my reading list for the summer. I actually started reading it after I watched the BBC mini-series with my friends (which I agree, is well done). Thanks so much for your interesting and refreshingly honest reviews. I'm glad you were alright even though you were in the ER! Now I want to read P&P again. Emma was not one of my favorites, but I can definitely appreciate it. The cover you posted is simply lovely!